It's happening this Sunday, and everyone will be there. 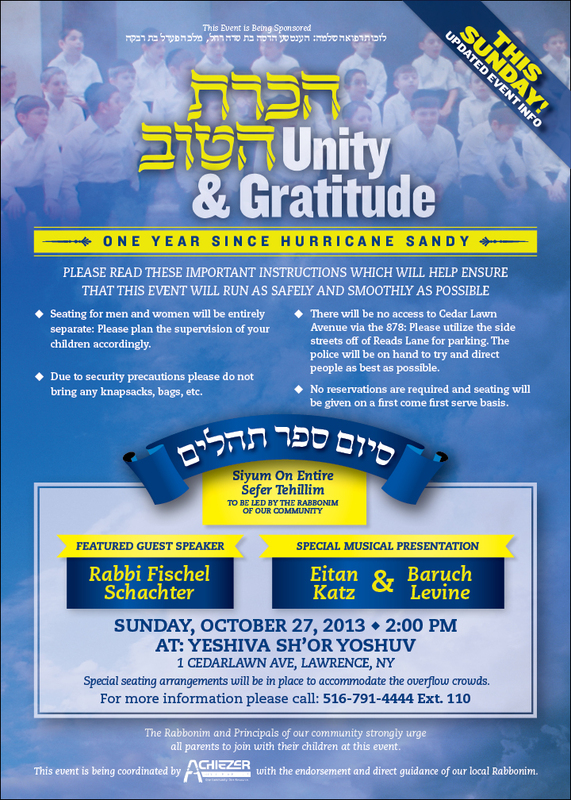 Approximately fifty Shuls and twenty schools from across the community are preparing to join the Unity and Gratitude Hakaras HaTov event, slated to take place THIS Sunday, October 27th, one year post-Sandy. We haven't forgotten. And now, it's time to give thanks. Sandy left our community devastated physically, financially, and emotionally - but miraculously, with no loss of life amongst us. And just as we pulled together as a community to rebuild what was lost, we gather together as a community to express our heartfelt gratitude over what was miraculously salvaged. Yeshiva Sh'or Yoshuv, the venue which brings back so many bittersweet Sandy memories, is being outfitted with special seating arrangements to accommodate the overflow crowds. Every one of us was a grateful beneficiary of Hashem's compassion that night. Every one of us can and should take the time to say a proper thank you. The program itself has been designed to be short, uplifting, and inspiring. Rabbi Fischel Schachter, a speaker universally beloved by adults and children alike, will present a brief keynote address, followed by the public recital of Tehillim led by Rabbanim representing each segment of the community. The event will include a special musical presentation by renowned singers Eitan Katz (a talented local who was personally affected by Sandy) and Boruch Levine, as well as a special surprise presentation by a young member of the community. The Rabbanim and principals involved in the event are overwhelmed by the sheer electricity of the Achdus already generated by this, a unified, public display of hakaras hatov, with no strings attached. Sandy will forever be seared onto our collective memories. And now, one year later, we will all be there, once again - together.